We don't know, but it seems like RIM has enlisted a couple more CDMA engineers because the gap between new devices launching on GSM and then making their way to CDMA has been getting noticeably smaller over time. 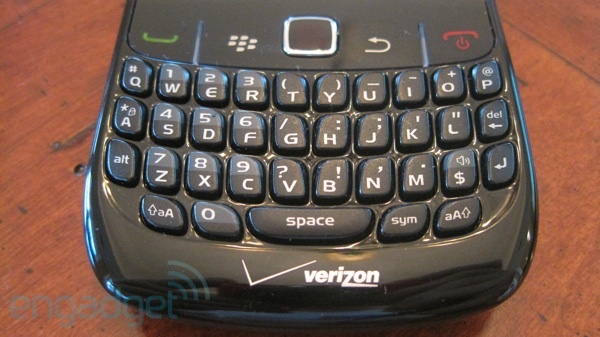 The BlackBerry Curve 8520 was launched on T-Mobile only a few short months ago, and it's already made its way to both Verizon and Sprint. It's not the same powerhouse as its older sibling the Tour, but this device packs a heck of a lot of punch into a very pocketable package. Read past the break for our extended impressions. The 8530 has a very sleek look to it, and it kind of reminds us of the Pre or PEBL with the rounded nature and lack of hard edges. It's not as "professional" feeling as the Tour, and we missed the soft-touch rubber surfaces and the shiny chrome accents. However, the Curve product line has always been more low-end than the Bold and Tour line, so we're not going to complain. The convenience keys and media control buttons along the sides and top of the phone seemed a bit cheap to us. Rather than being actual buttons detached from the main housing, they're built into it and don't have much feel. We do like the dedicated media keys up top, and think they're much more useful than the mute and lock buttons that you find on most other modern BlackBerrys. 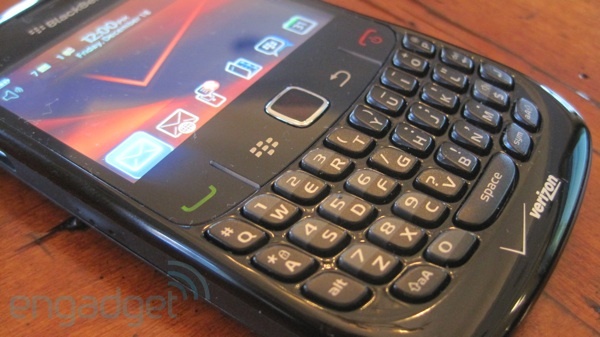 The keyboard, of course, is where BlackBerrys usually shine -- but after getting accustomed to the keyboards on the Bold, Tour, and 9700, we're a bit underwhelmed by the 8530's offering. It's essentially the same keyboard as on the original Curve (and all its subsequent variants), which means that the buttons are tactile and clicky, but a bit hard to type on. We know people who swear by the Curve keyboard, but for the most part, we prefer the mushiness of the keyboards found on the Tour and Bold. Much like the phasing out of the original thumbwheel, we're sensing that the end is near for the trackball as optical trackpads find their way into more models; the change is a point of contention for many a BlackBerry diehard, and we have to admit that it takes a bit of getting used to. The trackpad seems unnatural to use at first, but after a few hours of playing with it, we can see that it's a superior input method. Whereas trackballs have an uncanny knack for breaking, the optical alternative doesn't have the same moving parts so it's a much safer bet. We don't like the four navigation buttons around the optical trackpad, however, and find them hard to press and the uneven backlighting is a bit frustrating. They look like they'd be touch sensitive like the buttons found on the new Storm2, but they're actually physical buttons that take a bit of effort to use. 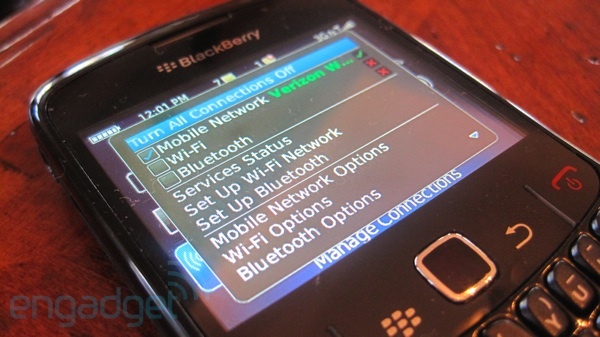 Depending on how you look at it, the BlackBerry OS can be seen as a strong point of consistency or an indication of just how little RIM is doing to advance the platform. Most of the BlackBerry models on the market today offer up a nearly identical user experience -- the only real variation being the Storm and Storm2, and even they carry over as many classic BlackBerry UI elements as they possibly can. The 8530 model we received came preloaded with OS 5.0.0.337, which means that it's on OS 5.0 -- the latest OS version RIM has released, which really isn't all that different from 4.5. The browser is nearly identical to the one present on the Tour, as is much of the rest of the OS. The addition of WiFi, however, is a welcome one. The lack of 802.11 in the original Tour is still something we're appalled by, but we're glad to see Verizon (and Sprint) coming through on their promises to include the requisite radios on all smartphones moving forward. Interestingly, the new BlackBerry Messenger 5 isn't included in the shipping firmware version, but it's easily added through a quick download from BlackBerry App World. Also, Google Maps still doesn't work properly with GPS, so you can get a location through triangulation but you won't get one through the GPS chip in the device. It works with the native Maps application, but as BlackBerry users already know all too well, that doesn't pack as much functionality as Google Maps does. Our Verizon-branded unit also came with icons for Verizon apps such as VZ Navigator and V CAST Song ID, although you'll have to pay extra on your plan for that action. To put the 8530 in context, we're gonna break it down against the Tour -- its closest competitor in the CDMA BlackBerry space -- as well as the 8520, its GSM counterpart. The most damning mark against the GSM 8520, of course, is the lack of 3G -- likely a cost-saving move that ends up making a virtually identical phone look way cheaper on paper. By contrast, you've got full EV-DO Rev. A on the 8530 -- a huge difference that pretty conclusively gives the 8530 the upper hand, carrier preferences aside. The differences against the Tour, though... well, that's another story altogether. While the 8530 packs both WiFi and that hot new optical trackpad, it lacks the world-roaming capabilities of the Tour and uses a different keyboard style that some users might prefer. 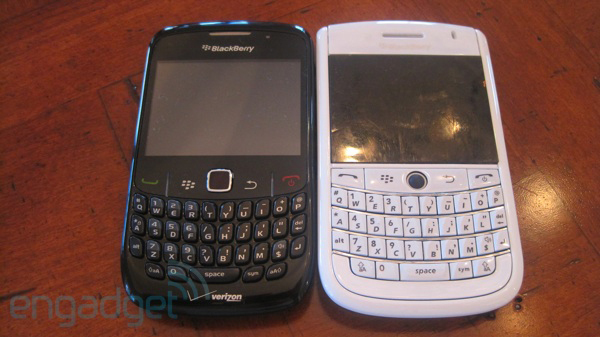 Oh, and here's a big one: the 8530 disappointingly sticks with RIM's older QVGA resolution, which makes a huge difference; the Bold and the higher-end BlackBerrys that have come after it set a benchmark for the way a portrait QWERTY display should look, and the 8530 just doesn't live up to that standard. We love the Curve and the Tour, but we're having trouble understanding the relationship between the two devices. 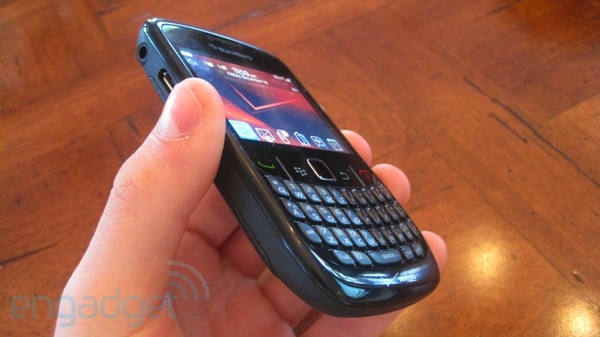 For a supposedly "low end" device, the Curve 8530 packs many "high end" features that the Tour lacks. We're expecting this to be remedied when RIM and the carriers finally decide to launch (or even announce) the Tour2, which should bring WiFi and the optical trackpad to the original Tour form factor. For now though, we're going to stick with the Tour over the Curve. The international roaming capabilities and better keyboard are enough to keep us from switching, although the WiFi would be convenient. When choosing which device is right for you, it really comes down to a matter of what's more important: international global roaming and a better keyboard or a slightly smaller package with WiFi and an optical trackpad -- assuming, naturally, that you're brave enough to deal with a QVGA display here in the year 2009.